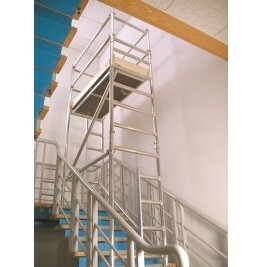 Hire fleet stairwell alloy towers are the best way for working at height over a stairwell, the tower components are manufactured to take into account the fall in height in the stairwell. In addition the stairwell alloy tower width allows for access around the side of the tower but also the stairwell tower also has specific access through the centre allowing the stair case to stay in operation. 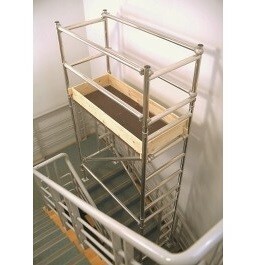 Stairwell towers are available from 2 metres to a maximum of 6 metres on the short side.